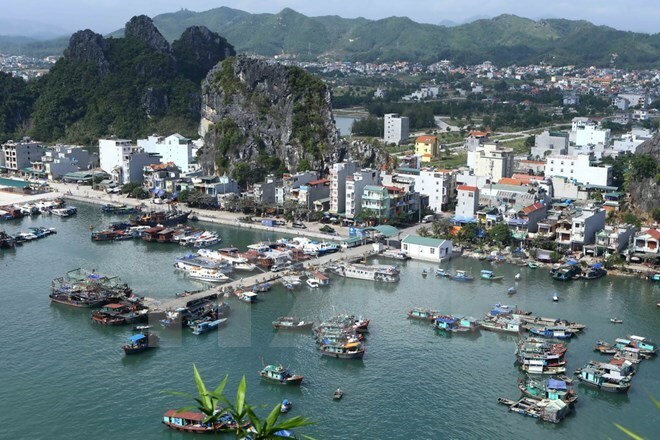 Quang Ninh (VNA) - The northern province of Quang Ninh has envisioned turning the Van Don special administrative-economic zone into a smart and green island urban area, according to Secretary of the provincial Party Committee Nguyen Van Doc. The special administrative-economic zone is located in Van Don district, which has a total land area of 581.13 sq.km and sea area of 1,620 sq.km with a population of over 46,000. The district has a politically and economically important position as it lies on the strategic transit route from East Asia to Southeast Asia and from ASEAN to China, in Vietnam-China “two corridors, one belt” cooperation area, in Nanning-Singapore economic corridor, and in the extended Tonkin Gulf inter-regional cooperation area. Van Don is one of the three special administrative-economic zones designated by a Government-approved plan; the other two are Van Phong in the central province of Khanh Hoa and Phu Quoc in the southern province of Kien Giang. The zones will pilot key new economic and administrative policies before they are applied nationwide to develop the maritime economy. Quang Ninh is working on a master plan of and a law on Van Don special administrative economic zone, guided by the aim to build Van Don into a dynamic economic centre with focus on services, high-end tourism and high-tech industries. The zone is expected to become a centre for startups, innovation and international trade. The zone will apply an environmentally-friendly development model with a streamlined administrative apparatus and competitive policies in order to tap the local distinctive potentials to the fullest extent and to attract investment and talent. The modern zone is expected to spearhead the province’s growth, consolidating Quang Ninh’s position as a leading economy in the northern region while ensuring national defence and security. The master plan of Van Don will define the local advantages with a view to pinpointing goals and priorities for development, draft a long-term development strategy for the zone and propose management model and apparatus. The province organised a conference to collect advice from the Association of Vietnamese Scientists and Experts (AVSE) in France on the master plan and invited Kien Giang and Khanh Hoa provinces to a workshop on the special administrative-economic zone master plan. Secretary Nguyen Van Doc stressed that the province hopes to put forward unprecedented mechanisms and policies for the zone to give it competition edge internationally. He said that the province will hire foreign consultants to draw up socio-economic development plans for the zone and revise the blueprint for Van Don economic zone to suit the new status as a special administrative-economic zone as directed by the Politburo at Conclusion No.21-TB/TW on March 22, 2017. A line-up of domestic giant groups like Sungroup and FLC have been pouring investment in Van Don district, including Van Don International Airport, Van Don luxury resort-entertainment complex with casino and many other high-end resorts.